Is the Six Nations ready to be expanded? For years in international rugby union, the Southern Hemisphere has dominated, with the Northern Hemisphere’s best struggling to cope with the likes of New Zealand, Australia, South Africa and even recently, Argentina, when the World Cup and Autumn Internationals have come around. You have to go back to 2003 and Sir Clive Woodward’s magnificent England side to find a last world champion from the Northern Hemisphere; South Africa were crowned champions in 2007, before New Zealand picked up back-to-back crowns in 2011 and 2015, as the All Blacks proved too powerful for anybody standing in their way. Perhaps one area that will help the likes of England, Ireland, Wales and France compete with the All Blacks and their Southern Hemisphere rivals is an expansion of the Six Nations tournament, which is held yearly and pits the ‘best’ the Northern Hemisphere has to offer up against each other. England have dominated the competition sine 2015, and whilst Eddie Jones’ side have looked good against Southern Hemisphere opposition under the Australian’s rule, when it comes to knockout rugby at a World Cup, there is still doubt as to whether the Red Rose can even compete, let alone the other nations who have struggled previously. Should the Six Nations introduce relegation? The Six Nations format has changed recently with bonus points introduced, encouraging more attacking rugby, with the hope that more tries will be scored as a result of a format similar to club rugby. However, there is certainly room for relegation and promotion to be introduced, with Georgia, in particular improving, year on year and putting their hand up for an opportunity to compete with the Northern Hemisphere’s best. The nation most vulnerable if relegation was to be introduced would be Italy, who are often seen as the weak link when the Six Nations come around, with the Italians often favourites to pick up the unwanted ‘wooden spoon’. Of course, the Italians could, in fact, benefit from another change in format, as the threat of relegation would undoubtedly provide Italy with added motivation to climb above one of their Six Nation rivals. What would this mean for the likes of England, Ireland and Wales? Added to that, the more there is at stake in the Six Nations would create a more competitive competition, which, in turn, will help the likes of England and Ireland – who often have Grand Slam hopes when the competition comes around – when the World Cup comes around and they are looking to compete with their Southern Hemisphere rivals. England look like matching New Zealand and Australia when they face them outside of the World Cup, but the 2015 competition showed that when the pressure is on, no matter how well prepared the Red Rose are, they are at risk of coming unstuck. 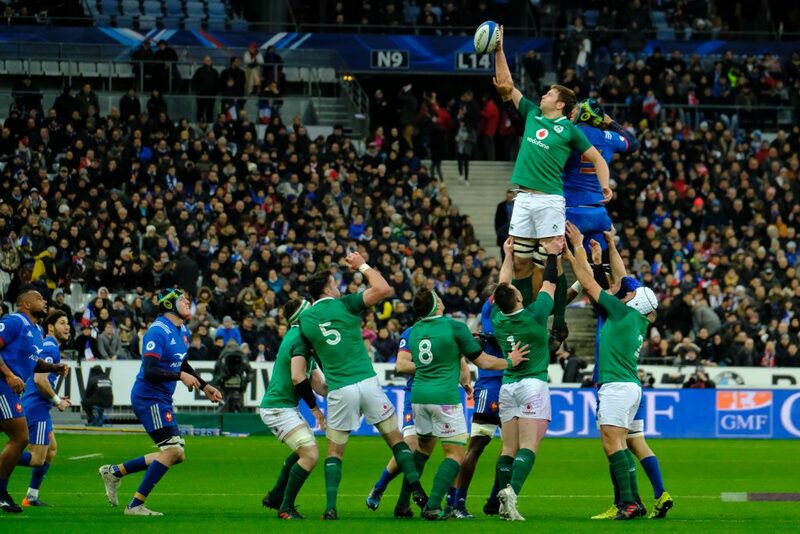 Ireland in action during the NatWest Six Nations Rugby tournament between France and Ireland at the Stade de France. A more competitive Six Nations tournament, where every game matters to every single nation, would ultimately improve the standard of the competition and could play a huge role in helping the Northern Hemisphere sides in knockout competitions such as the World Cup. Whilst England and Ireland are developing quickly and looking for success at the World Cup, the competition they face in the Six Nations isn’t good enough, particularly when you look at the fact that New Zealand, Australia and South Africa will all be preparing against each other in the coming months. A change in format for the Six Nations could certainly provide an opportunity to bring the Northern Hemisphere up to speed with their Southern rivals.